I love Distress Inks and Markers. They have so many applications and uses. One of my favorites is to use them as watercolor inks. They react to water so well that they're perfect for what I have for you today. 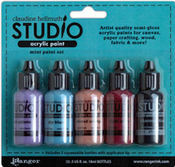 Watercolor resist! 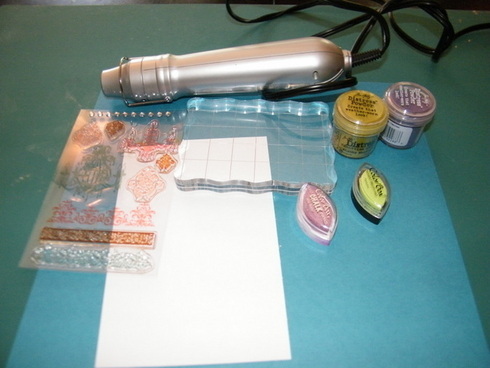 Let's start by picking out stamps to use as background patterns. You'll be needing some watermark ink, embossing powder and a heat tool. 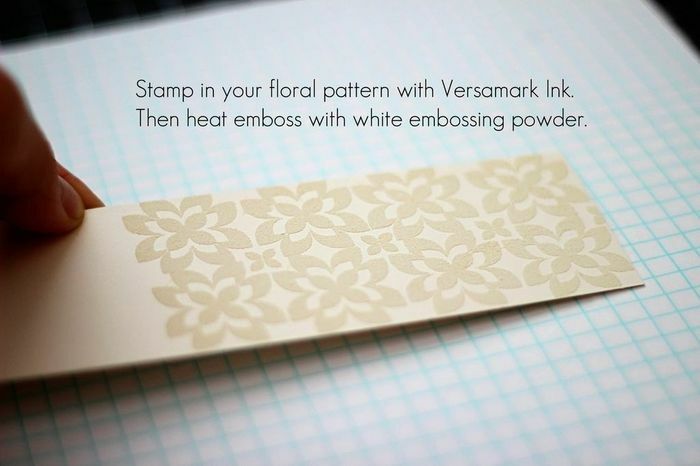 Now start stamping your pattern on a strip of cardstock. 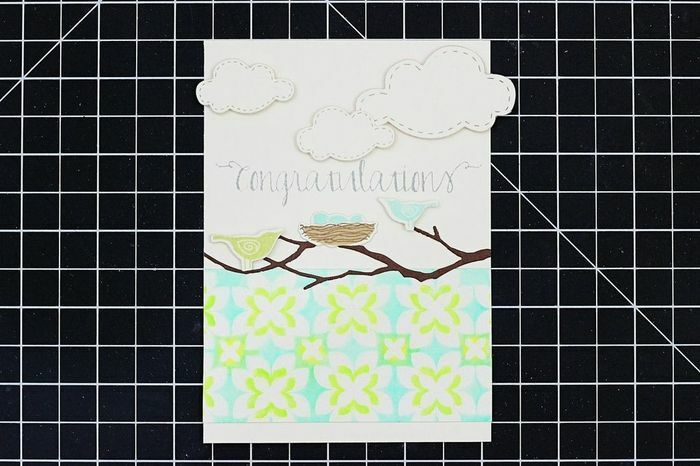 I used white embossing powder because I wanted it to stand out against the colors I'm planning on adding in. 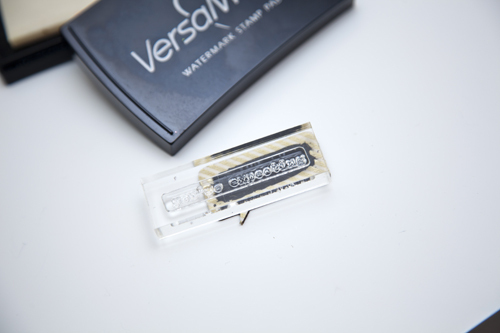 If you miss any parts with your stamp and watermark ink, you can always follow it up with an embossing pen. 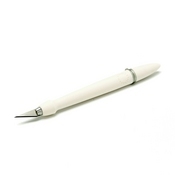 It's the exact same thing, except it's in pen form. 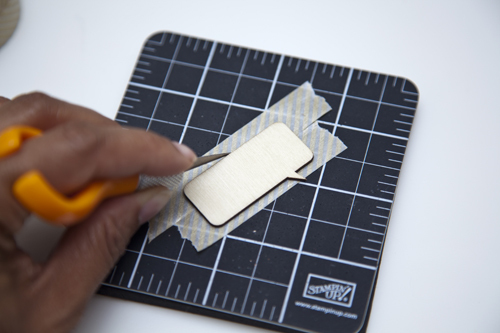 You're going to need a craft mat for this part. The more water you add the lighter the color will be. 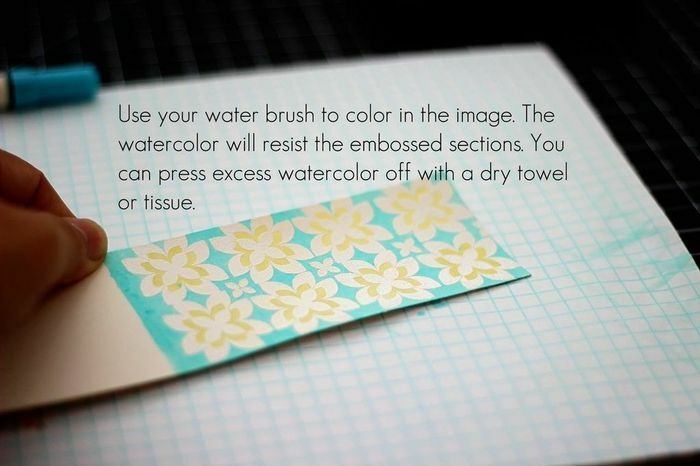 Now use a water brush to pick up your ink and start coloring in your pattern. You can dry the portion you just colored in with your heat gun to make sure it won't mix with your second color. 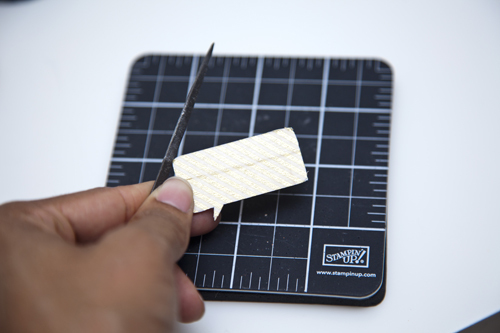 Make sure you heat up your heat tool before you apply it onto your strip of cardstock. It will lessen any warping. For this tutorial image I used a darker shade of Peacock Feathers so that the image is more visible in the photo. But for my actual strip, I used more water to dilute the ink and make it lighter. 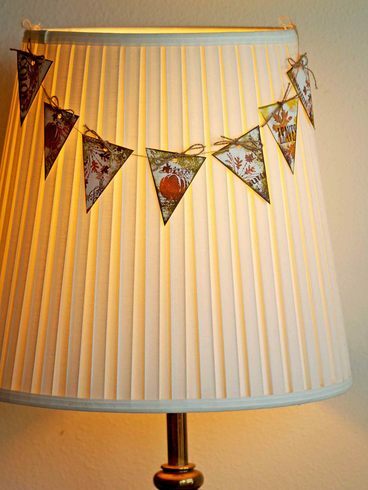 Set your patterned strip aside to dry or use a heat tool to speed it up. While it's drying, you can pick out any images/dies you want to use to build a scene for your card. 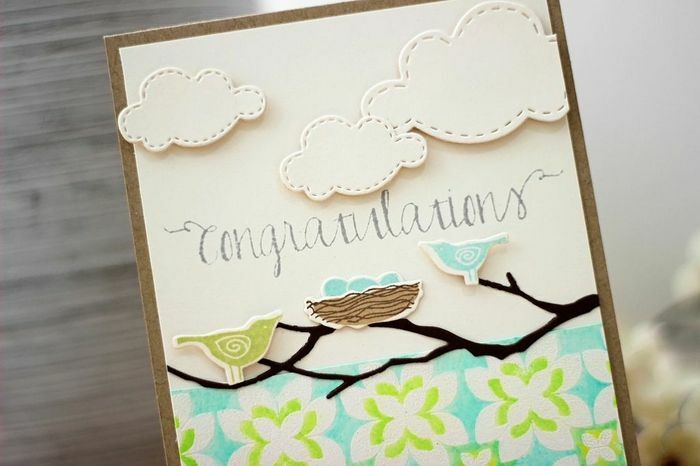 Start building your card by placing your individual images/dies onto your card. You should move things around and find the best composition that is well balanced. Don't forget to add your sentiment. Lastly, trim off the parts that are hanging off the sides of the card that you don't want included in your final project. 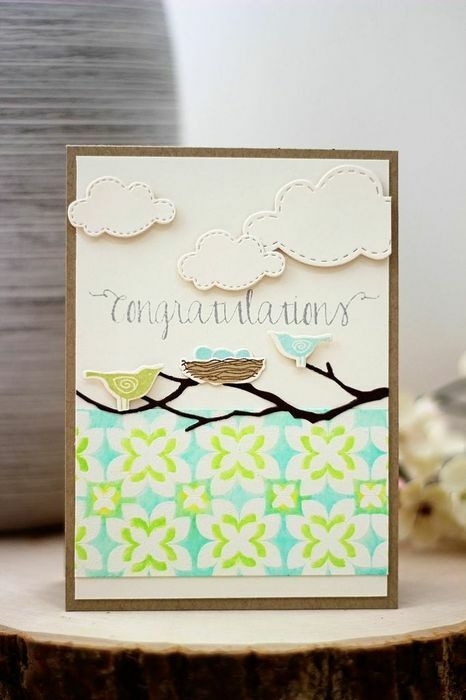 Then attach to a card base. Make sure you adhered the different elements of your card at different heights. It will give wonderful dimension to your card. There you go! 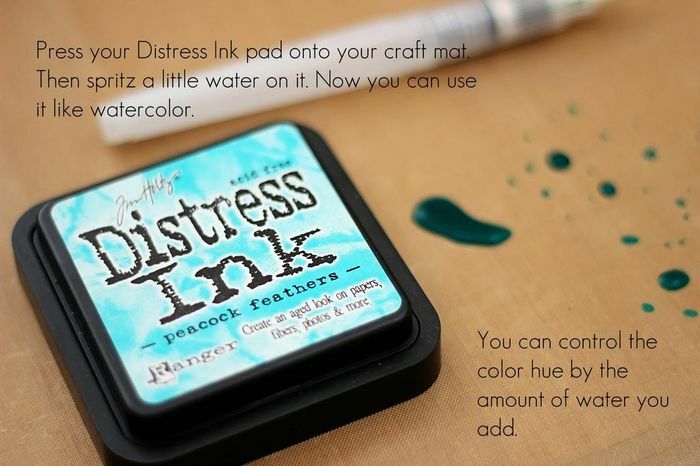 Watercolor resist using Distress Inks and Markers. Why don't you give it a try? :) Thanks for stopping by today! I'll be back again soon with another tutorial for you! Happy National Scrapbook Day! In this post, I'm focusing on wood veneer, one of my current favorites! 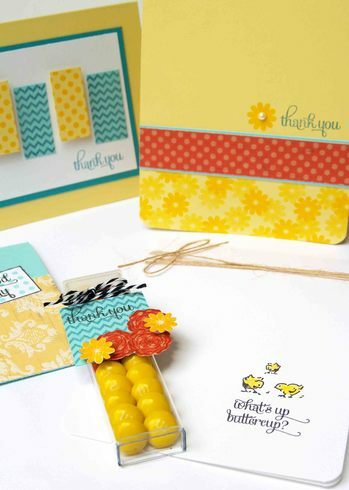 You can add these awesome finds to layouts, mini albums, or cards. Use your creativity! 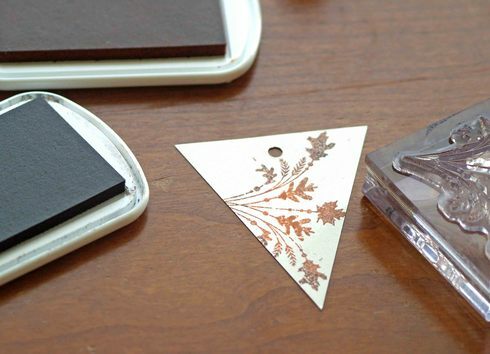 I have a couple of fun ways you can transform plain wood veneer into new, interesting embellishments. 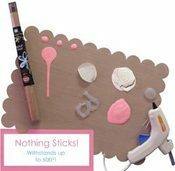 Here are some supplies you can pull out to dress up your wood veneer. 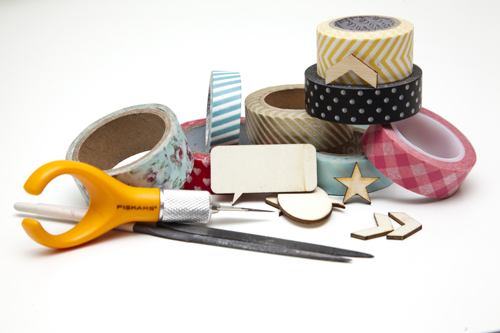 Don't forget your favorite washi tapes, wood veneer, precision cutting tool, and filing tools. 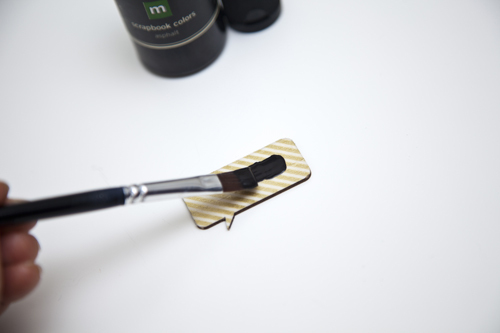 To start, cover your wood veneer with washi tape. Washi tape is very forgiving, so have fun! 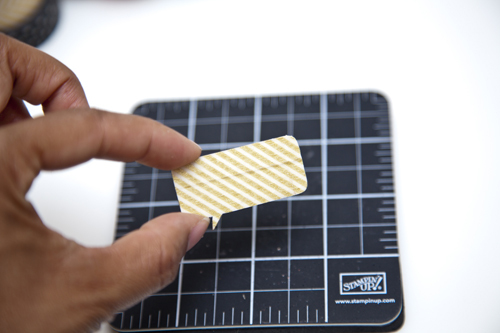 What if one piece of tape will not cover the wood veneer completely, like photographed above? No problem! Simply line up another piece of washi tape making sure that the patterns match up. 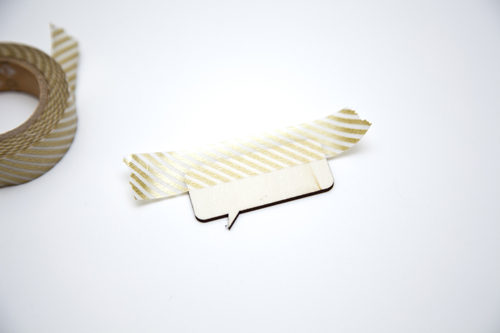 You could also use the washi adhesive sheets in the store! They'd be awesome for these speech bubbles. It's up to you! 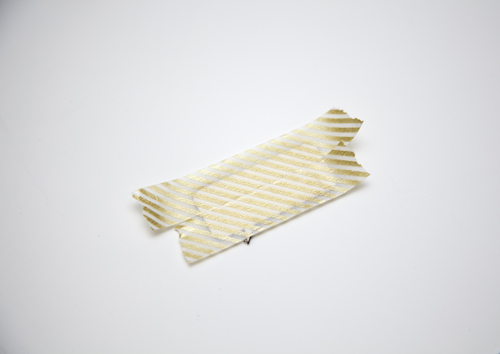 Using your precision knife, trim off the excess washi tape. I like to flip the wood veneer over so I can see where I need to cut. After trimming, use a filing tool to even out all the edges. Here's the finished washi covered wood veneer. Isn't it so cool! Just think of all the pattern possibilities!! You can definitely use it as-is or take it a step further (see next step)! 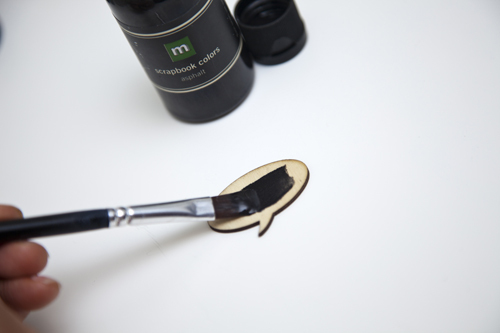 Speaking of painting, don't forget that you can alter your wood veneer by simply painting them...any color. You can use your spray mists, too! Like to stamp? I do, too. 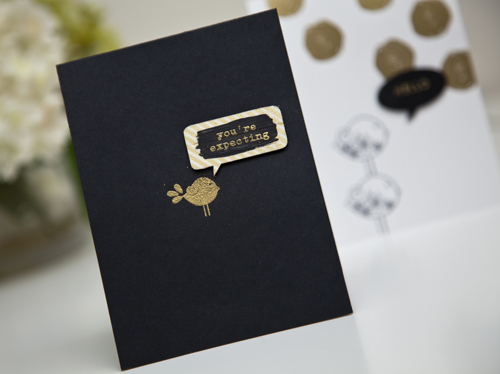 So, how about heat embossing a sentiment on this speech bubble?! 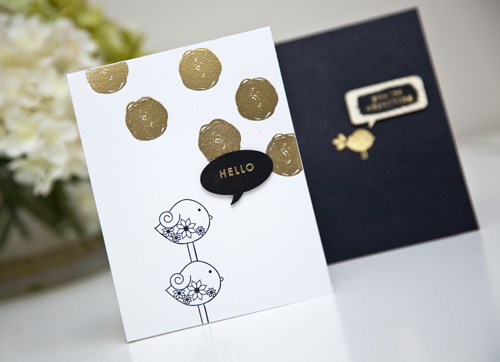 The cool thing about heat embossing is that you can add just about any color to the stamping process. 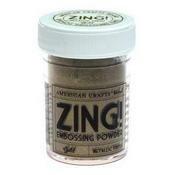 I'm using gold embossing powder on my projects. Check them out below! 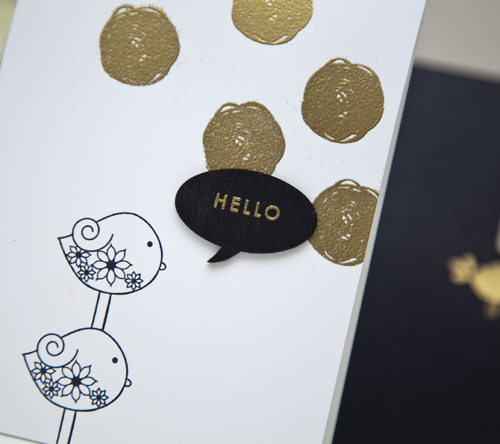 On my first card, I heat embossed "hello" onto a painted wood veneer speech bubble. The result is so elegant and professional. For my next card, it's a clean and simple design, but ever-so-striking. 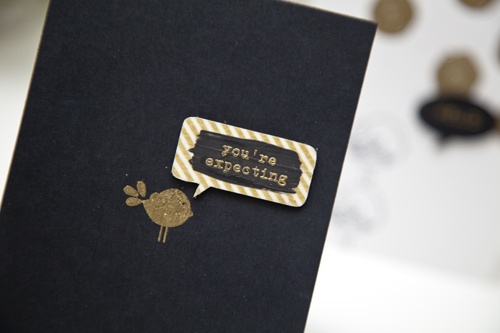 The striped washi tape pops along with the heat embossed sentiment. 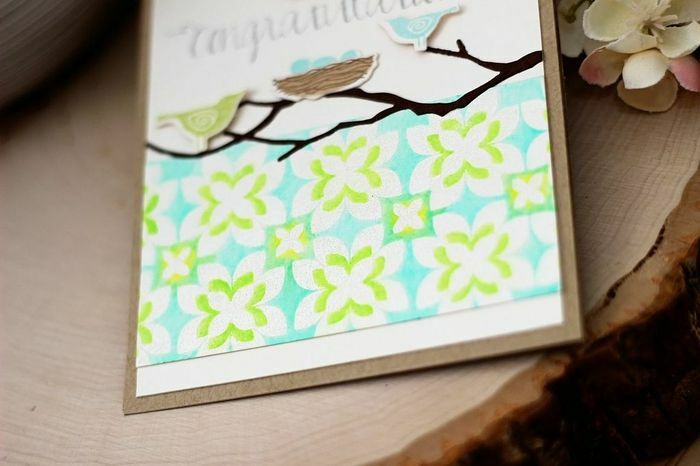 I just love how you can transform wood veneer so easily with just some washi tape, paint, and embossing powder. So, what are you waiting for? 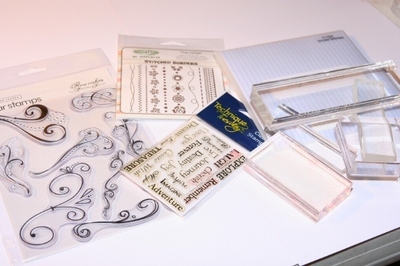 Get your supplies out and transform those wood veneer embellishments in your stash now! 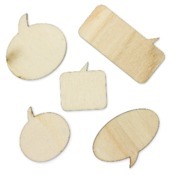 You can use any wood veneer shape you have, but the speech bubbles work great on cards and layouts I think! 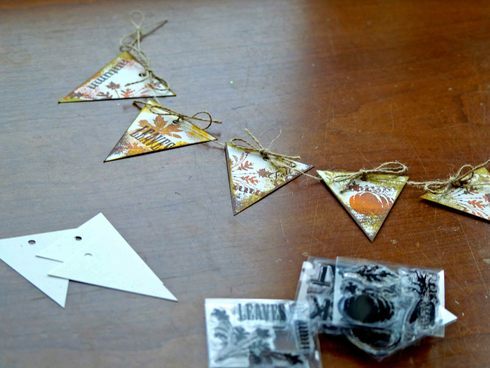 I don't have lots of wall-space to hang a fabulous GIANT autumn garland, but I thought a petite-sized garland made of these cute little triangle tags would be the perfect addition to a lamp, hung above a picture frame or mirror, or even on a door. 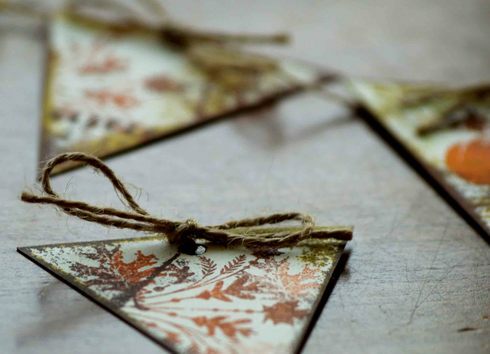 As we create, I'll share some of my favorite techniques for creating this warm and cozy stamped project. 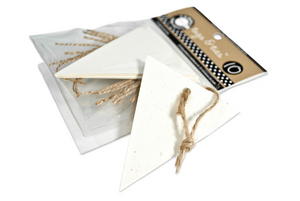 Speckled Triangle Tags & Ties by Canvas Corp. 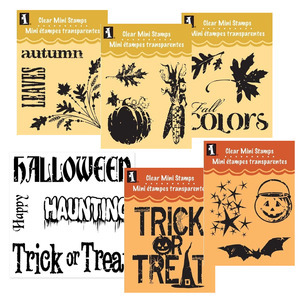 I LOVE this set of 6 little stamp sheets on sale in the store - and you can't BEAT the price. (For REAL! How have you NOT bought these yet!?) I decided to make my garland autumn themed, but without too much focus on Halloween or Thanksgiving in particular - so that I can hang it up now, and leave it up through November. 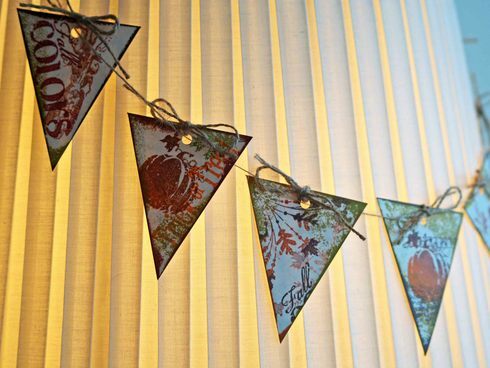 I used the stamps and simply created 7 little triangle tags to string along. Here are some techniques to try, while you play. 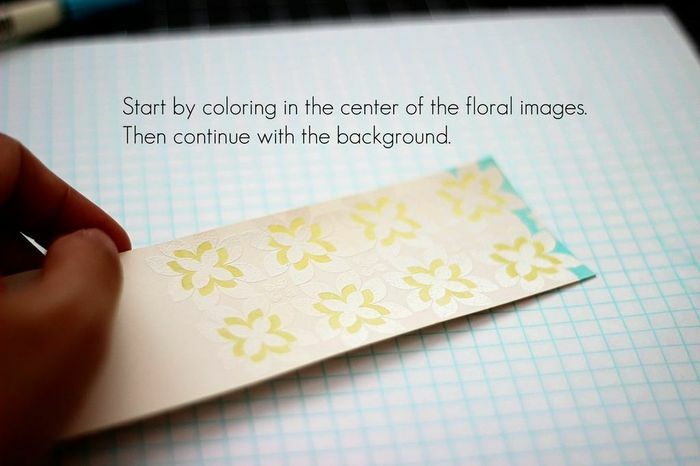 Blending ink colors - to create a multi-colored image, start with the lightest color. In this case, I stamped the image in a terracotta color. Then I tipped the edges of my stamp into a dark brown. 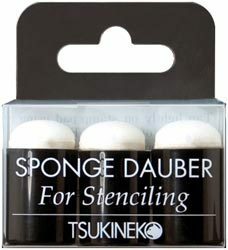 Now comes one of my favorite tools: a sponge dauber. Use the dauber to gently dab over the stamp where the colors meet. This will blend the colors together. Then stamp on the triangle tag. This technique works really well with solid images, like this leafy spray. 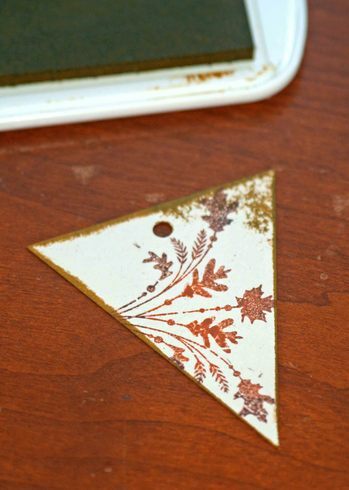 The next technique I used to add to my triangle tag is along the edges. 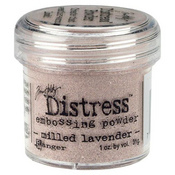 Distressing - drag, dab, or pull the cardstock edge along the ink pad to add this detail. You'll find that different ink pads create different looks. A different amount of pressure will also effect the look. 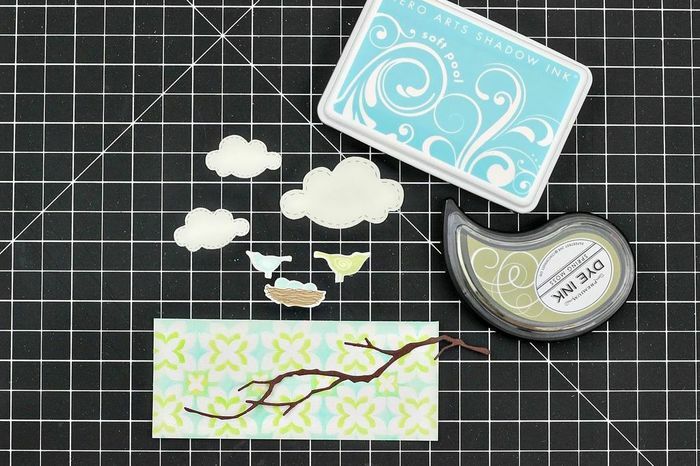 Play with some scrap paper and perfect YOUR favorite look. Faux sponging- After, and during the distressing, I also gently tapped sections of the tag flat onto the ink pad. See that area in the top right corner? It almost looks like it was sponged, but it was just set down onto the inkpad. Depending on the juiciness of your inkpad, this technique can get away from you easiy. . .so be VERY gentle! Distressing times 2 - After distressing the edges with the mustard color, I decided to add a little more, and go over it again with dark brown. I also added a few extra stamped leaves to finish off the tag. Using a dark color along the edges will add extra drama and help "finish off" the look. I used these techniques on all of the tags I stamped. Each one is a little different, and I used lots of images from this stamp set, including some of the great autumn words. I used a few different colors on the tags, but each tag has mustard and dark brown. This adds some consistency and allows the project to flow cohesively. As a finishing touch to each tag, I tied a bow using the twine included with the Canvas Corp. tags. 5 tried and true ideas you can use TODAY! 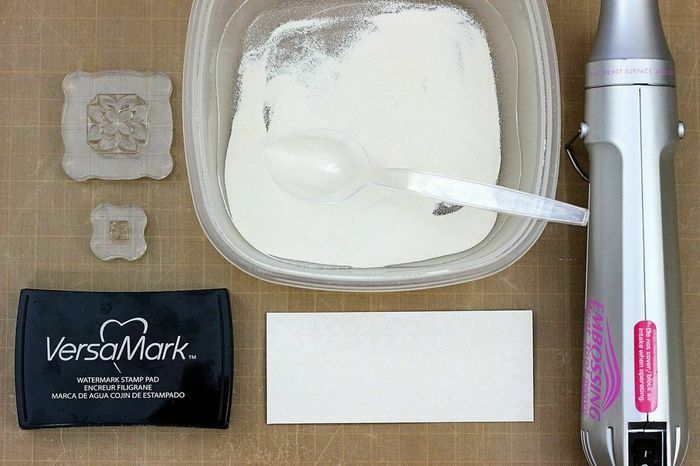 Easy and quick techniques to enhance your acrylic stamps. Acrylic stamps are everywhere these days. 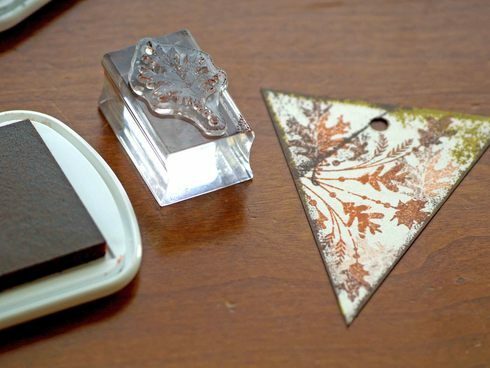 Here are a few fun and easy techniques to add a little zest to your acrylic stamping.